In 1994 the excavation of ore in Mežica mines was stopped. This means water was no longer drained from the mine so its lower parts were completely flooded all the way to the water shaft where the water flows out. Flooded excavation sites now seem like magical underground lakes. This underground adventure starts in front of the mining museum in Glančnik in Mežica. Visitors board a genuine mining train which takes from the museum through the 3.5 km long Glančnik tunnel and up to Unionski vpadnik slope mine. From here you descend for 95 m and go down the stairs that lead to water. At this point, all visitors receive the necessary protective equipment (neoprene boots, life jackets and mining helmets with a flashlight). Then you enter a flooded shaft where special kayaks for three persons are already waiting for you. Your guide leads you along a small underground river until you reach the magical underground lakes almost 700 m below the surface. Visitors can now enjoy the peaceful and pristine water and explore the underground labyrinth, submerged tunnels and excavation sites. To end your journey, you will follow a narrow passage, paddle through some minor rapids and arrive back at the starting point. 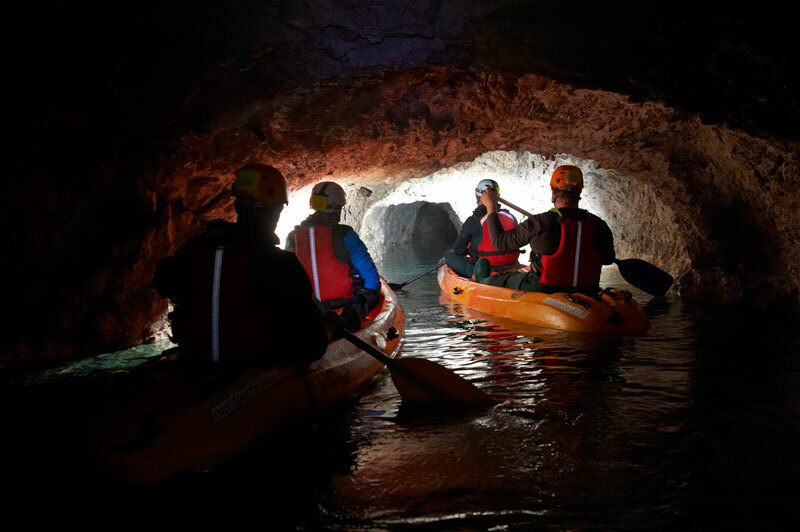 After the kayak ride is completed, you will take a walk pass the abandoned underground working sites to the mining train station. Allow your guide to take you back to a time when the mine was not immersed in silence, but rather full of miners working away with different tools and machines. After a real miner’s lunch, the train will take you to the mining museum where you can admire a number of interesting collections. These display the daily lives and work of miners in the heart of Mount Peca as well as precious ores and minerals, wonderful creations of Mother Nature. The entire tour lasts 4 hours. One group can consist of max. 10 people. The age limit is 10 years (minimum height 1,5m ). Visitors must wear appropriate clothing and walking shoes. Average temperature in the mine is 10 °C. Mine tour by kayak is only possible by prior arrangement; phone (+38628700180) or email (info@podzemljepece.com).